Both teams topped their groups and advanced directly to the semifinals, where NiP eased past CPLAY while ESC Gaming managed an impressive win against fm.TOXiC. The Poles managed their first top finish at an important event after switching to CS:GO. Moving on to the grand final, the first map to be played was de_train_se, a map known for its imbalanced CT - T side account. NiP started off as Counter-Terrorists and took an early advantage of 5-0, after which ESC Gaming finally won their first round. This was about to be their first and last round of the first half, as NiP did not have mercy and went to a 14-1 lead. Second half started with the Poles winning two rounds, but they were quickly put to silence as NiP won the next two, making the final scoreline 16-3. Next map would be de_mirage_csgo, a map where Ninjas in Pyjamas were arguably considered the better side even from the begining. The Swedes started as CT's again, but lost the pistol round this time and ESC were the ones to score the first blood. NiP took control of the match in the coming rounds, having a 10-5 lead over at halftime. After teams switched sides, only a miracle could turn the game around for ESC Gaming. 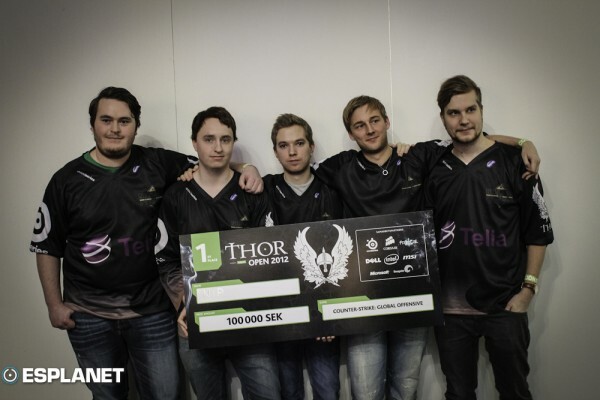 This was not about to happen, as NiP won the opening rounds and had a 15-5 advantage. The final score was about to be 16-6 in the favour of the Swedes. NiP now have won their sixth consecutive grand event and it looks like their supreme dominance in the CS:GO scene will continue. One of the names that surprised everyone to make it to the top places were CPLAY. The Danes managed a fourth place finish, losing to fm.TOXiC in the 3rd place decider match, and added €500 to their pockets. If you missed any action from the CS:GO tournament hosted at NorthCon, be sure to visit our coverage item.